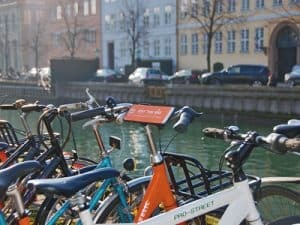 You’re in one of the best cycling cities in the world, so renting a bike to explore Copenhagen is really a no-brainer. It will give you the freedom you need to discover the Danish capital in a fun, authentic way. Take your time to explore every neighbourhood in the city, as you’ll discover that each of them has its unique identity and vibe. 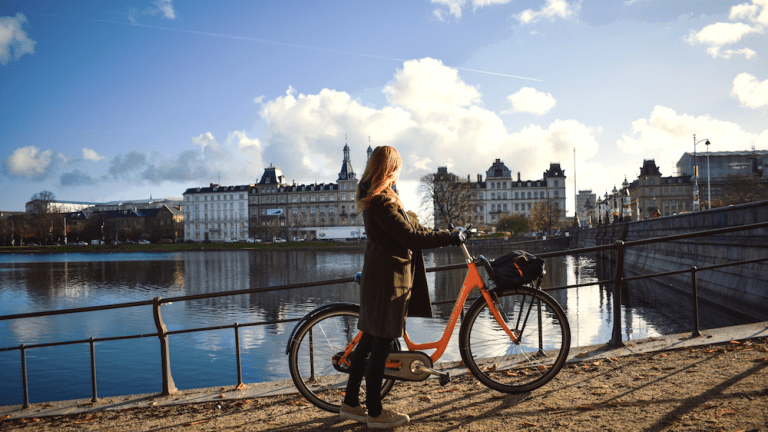 The good news is that you can start your Copenhagen bike tour pretty much anywhere, because, unlike traditional Copenhagen bike rental shops, we have rental bikes spread around the city in various pickup locations. Find a bike near you in the Donkey Republic app and start your adventure on two wheels! 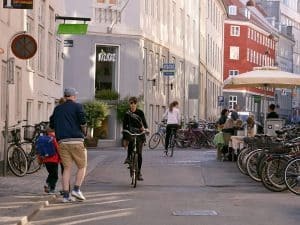 Before you saddle up your rental bike, check out our recommendations on exploring Copenhagen on a bike, as well as the most important Danish cycling rules you should respect to keep yourself safe and sound during your bike rental in Copenhagen. 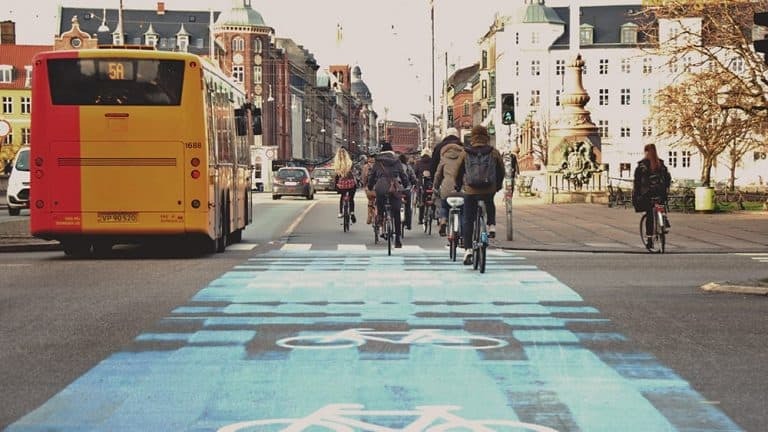 There is a lot more to sustainability than renting a bike in Copenhagen. Discover and experience a capital that plans to be carbon neutral by 2025. This ambitious plan includes a lot of initiatives concerning transportation, energy supply, adjusting to climate changes and green architecture. 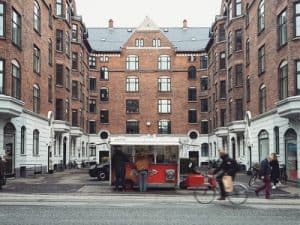 If you are interested in touring the most unique spots of Copenhagen on your rental bike, join one of the Green Bike Tours. Copenhagen’s city centre, a.k.a. Indre By is easy to mark out on a map because it’s surrounded by water – be that canals, the lakes or the sea, all beautiful to ride your rental bike along. 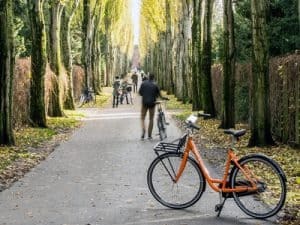 Naturally, you’ll want to include popular attractions on your bike route, such as Nyhavn, the Little Mermaid (Tiny Mermaid would be more accurate, though) or Rosenborg Castle. But there are also lots of parks and green areas (Kongens Have, Ørstedsparken and Kastellet come to mind), as well as countless mazy streets with cosy cafés, tiny design shops or lavish department stores to get lost in. Worth mentioning are Paludan Café for a relaxing break and a bite, and the Hay store for the coolest Danish design shopping session. This hood is poetic chaos. It’s vibrant, colourful and multicultural, with virtually no wall left untouched by urban art and social discourse. If you fancy a street art treasure hunt, you’ll want to read about our street art bike tour first. 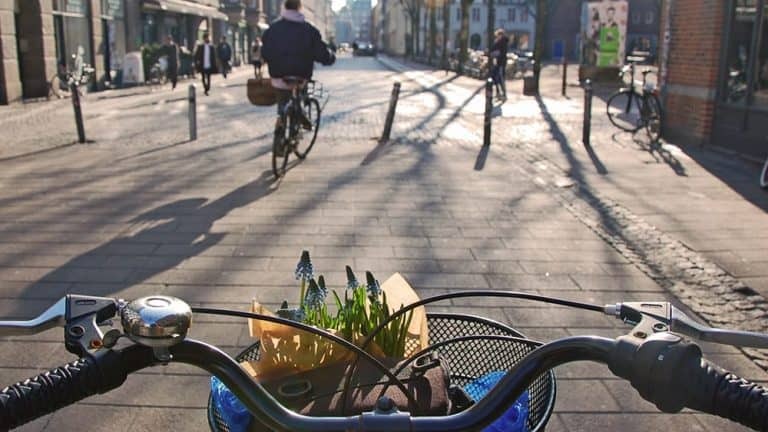 Rent a bike in Nørrebro and take your time to explore the area. Don’t miss The Red Square (Den Røde Plads), where the Green Path bike-only route passes. 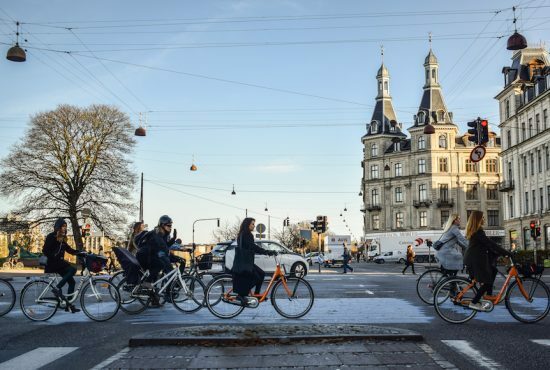 If you keep riding on Nørrebrogade, you’ll reach the lakes and the beautiful Dronning Louises Bro – a popular hangout for locals and travellers alike. 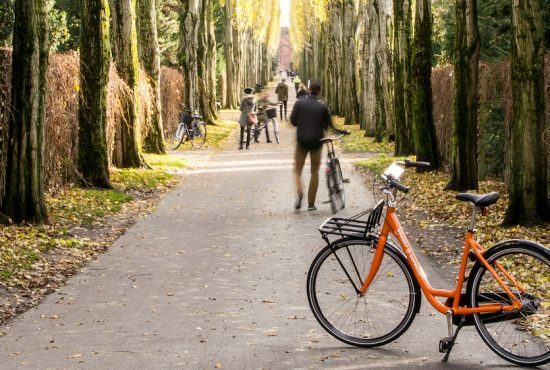 Another must is riding through Assistens Cemetery – trust us, it’s not your regular graveyard. Frederiksberg is Nørrebro’s neighbour, as well as its antonym, which is why it’s particularly nice to cycle between them back to back to feel how the air changes from one area to the other. Frederiksberg is so neat and peaceful, with beautiful façades and fancy cafés (including delicious cheesecake), flower shops and lots of baby strollers. There are some particularly nice streets you can ride your Donkey bike by, such as Falkoner Alle, Gammel Kongevej (when it’s not peak hour) or Frederiksberg Alle. 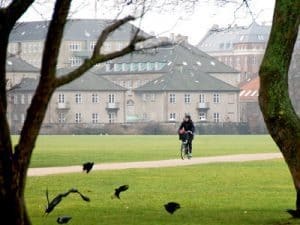 Also, you have one of the biggest green areas in Copenhagen nearby, made up of Frederiksberg Have, Søndermarken (check out the Cisternerne art gallery here!) and Solbjerg Kirkegård – with the Frederiksberg Palace right in the middle of all that. Christianshavn is technically part of Indre By – so lots of canals to ride along here as well. However, this neighbourhood has its very own charm to be explored by bicycle with a fresh breeze in your hair. You’ll find the famous Freetown Christiania here, with so many bohemian spots in and around it to discover. It’s actually a good idea to save some time for a dedicated Christiania bike tour, and see if you can discover this hidden beach – it’s really a special spot you won’t regret searching high and low for. If you happen to get hungry while you’re in Christianshavn, make sure you stop by Papirøen, or Copenhagen Street Food. Other attractions and cool sights in the area are: the Church of Our Saviour, the Royal Danish Opera House, the very new and cool Copenhagen Contemporary art centre. The district of Østerbro is located north of Copenhagen’s city centre. On the map, it starts where The Lakes (Søerne) end and extends all the way to Hellerup in the suburbs. 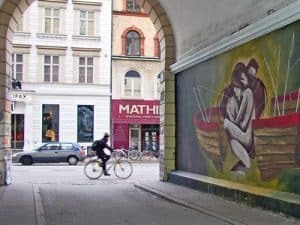 Østerbro is currently very attractive as a residential area, so you could spend an entire day just cycling across its streets, staring at the posh façades, peaking into green backyard oases or going full gourmet in some fashionable delicatessen. Alternatively, you can take your rental bike through Østerbro’s natural riches – on a ride in Fælledparken or to the beach, at Svanemøllen. Here are a few places worth stopping by fancy Original Coffee at Trianglen, low-key Café Bopa, high-brow Den Frie Centre of Contemporary Art, and hippie Candy Factory. This is an all-time darling of Copenhagen’s neighbourhoods. There are lots of spots to explore on your rental bike in Vesterbro. There’s the very popular Meatpacking district, a.k.a. Kødbyen, which has evolved from trading livestock to trading beers for cigarettes in some hip bar’s entrance cue. There is also the Carlsberg Brewery to visit, which feels like going to the museum, but with lots of alcohol. 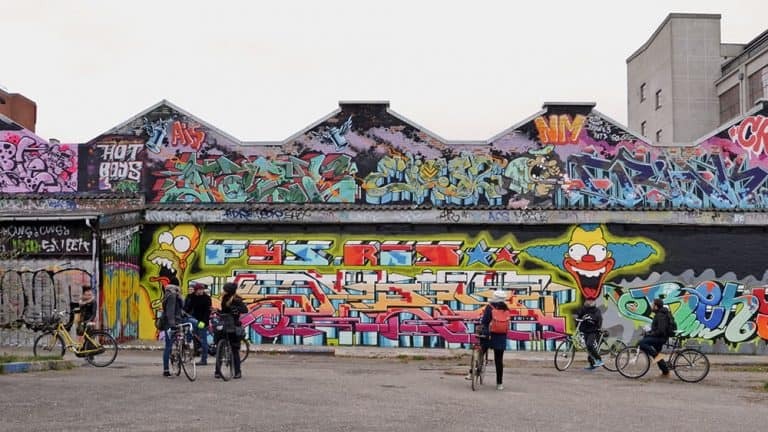 And then there are quirky flea markets on Sønder Boulevard, unconventional art galleries and Instagram-heaven bistros (Mikkeller Bar, WarPigs and Bakken, to name a few), as well as beautiful murals you can suddenly discover on side streets as you cycle around. Ride through the intersection on the right, while signalling with a raised hand that you’re stopping; stop at the corner of the street you want to join and wait for the traffic on the right-hand side for the green light to proceed in your new direction. Find a visual explanation of the Danish “hook turn” here. As soon as the sun sets, turn on the lights on your rental bike. This is how you avoid a serious fine (DKK 700) as well as, you know, falling off your face. Good thing is, if you’re here during summertime there’s so much daylight you won’t have to think too often about this. 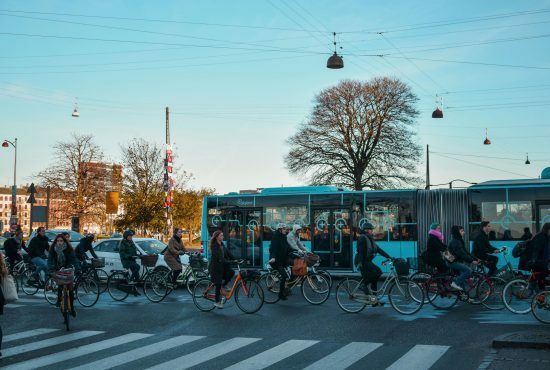 In Denmark, bike helmets are not mandatory and, even if there’s quite a debate regarding whether that’s OK or not, very few people actually wear them. Therefore, protecting your brain is totally your call. If you decide to do it, go to these guys and show them your Donkey Bike booking – they’ll give you a helmet for 25kr/day. If you see people around doing hand acrobatics on their bikes, it means they’re trying to communicate with you. One hand straight up means stopping, right hand to the side – turning right, left hand to the side … you get the drill). Use these hand signals while on your rental bike, or you’ll most probably get run over by a Dane who’s rushing to make it work. Kidding, Danes are never late to work. There are more than 25,000 homeless bikes on the Copenhagen streets.